A huge part of my collection consists of dishes, and Fiestaware is one of many. I love my Fiesta! It was made in 1936 by the Homer Laughlin China company until 1973, when it went on a hiatus until 1986 when it was reintroduced, no doubt to the new interest in all things Art Deco. The concentric rings are a pleasing pattern and the cheery colors invite fun and creativity. I have two 5-piece place settings and at least two accessory pieces of every color since it was re-introduced in 1986, including the coveted Lilac and Sapphire. Fiesta has taken its rightful place on many dinner tables, and often finds itself in everyday use. 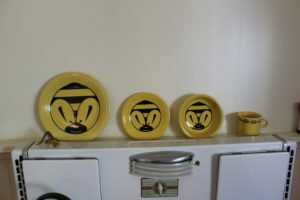 Homer Laughlin also creates several pattern designs on Fiestaware, and one was Bumble Bee. I purchased one set of this whimsical pattern from J. C. Penney, along with Ladybug. My kitchen is now yellow, so I have Bumble Bee over the cook stove.